Puttur, Apr 12, 2019: A labourer of West Bengal origin sustained critical injuries following electrocution while he was engaged in some repair works in an electric pole near Little Flower School, Darbe. 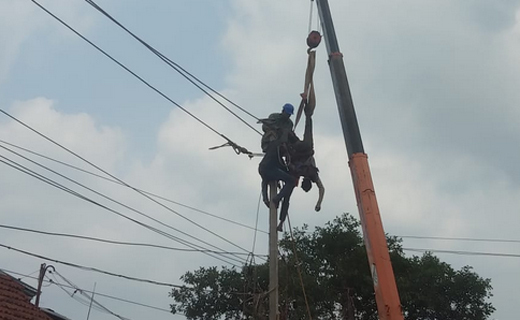 Another labourer who too was in the electric pole jumped down to safety. The injured labourer has been identified as Manikya (24) of Kolkata. He has been admitted to a hospital in Mangaluru. The workers were engaged in replacing old cables with new cables in a high tension power line when the mishap took place. Locals have blamed MESCOM officials for the incident.